The In-House electrical inspection can be done by the home owner but please always use safety first. We recommend using a camera and note pad to make notes of any observed issues. You must be sure to avoid touching any of the electrical systems (especially if you discover any exposed wires). This is a visual inspection and should take around an hour to be completed depending on the size of your home. You will start your visual inspection of your home electrical system by going around and inspecting each one of your electrical outlets. 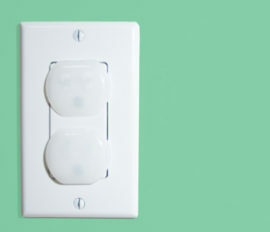 You will be looking for any sort of damage to the electrical plug and switch covers. Again, it is important to avoid touching any of the electical systems at this time. If you have any questions or concerns with your visual inspection, you should have this checked by a professional and repaired as soon as possible. If you don’t understand or are not familiar with the systems operation, do not try to correct this on your own. The wires are live and can cause damage if not handled properly. This is a simple electrical-inspection and should be done on a regular basis, especially if you have young children. Always remember it’s safety first. If you have young children you can purchase an inexpensive package of outlet covers and install them on any child accessable open sockets. They are available from most hardware and department stores.